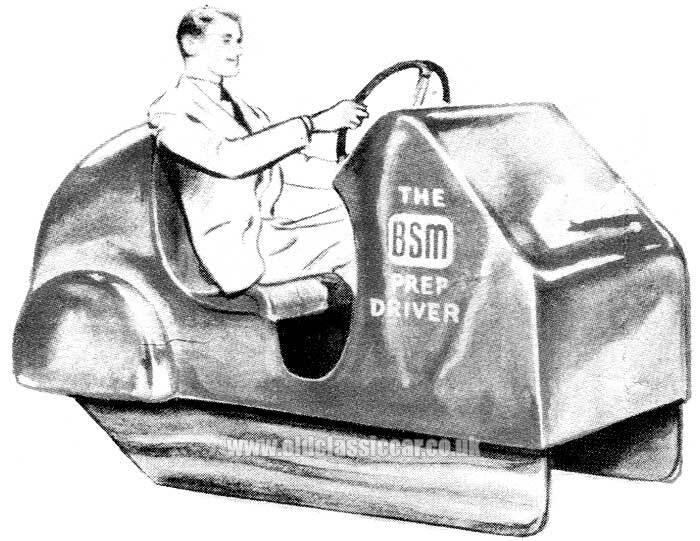 The BSM Prep Driver, a driving tuition aid from the 1950s. Homepage. This page: Test your reactions behind the steering wheel with BSM's new-for-1952 car simulator. British School of Motoring's "Prep Driver". 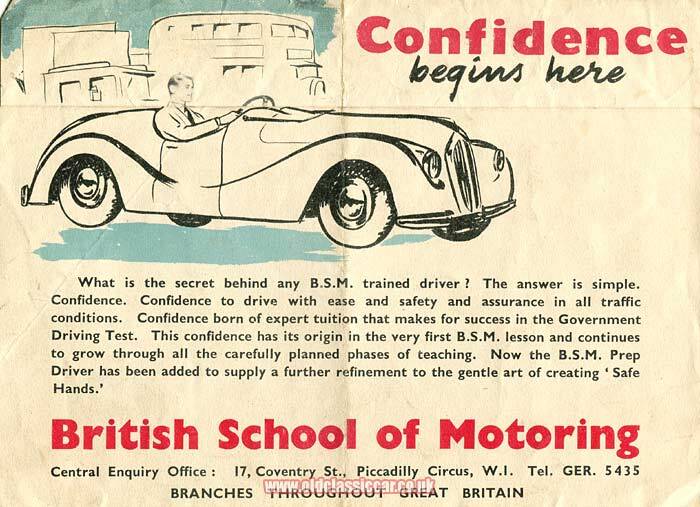 This fascinating leaflet was handed out by employees representing the British School of Motoring (BSM), at the Earl's Court Motor Show in 1952. It describes the new BSM "Prep Driver", an ingenious machine designed to both familiarise aspiring drivers with a typical car's controls, and also test the reaction times of seasoned motorists. Held horizontally, the leaflet incorporates an illustration of a dapper chap cruising along in his two-seat sportscar (which has echoes of Jaguar XK120, Jowett Jupiter and Lea-Francis Sports to it I reckon), with an omnibus in the background. What is the secret behind any BSM trained driver? The answer is simple. Confidence. Confidence to drive with ease and safety and assurance in all traffic conditions. Confidence born of expert tuition that makes for success in the Government Driving Test. This confidence has its origins in the very first BSM lesson and continues to grow through all the carefully planned phases of teaching. Now the BSM Prep Driver has been added to supply a further refinement to the gentle art of creating "Safe Hands". Fold down the leaflet and it reveals the same gent, now sat behind the wheel of the Prep Driver, a red coloured machine with a hint of dodgem car to its form. A great stumbling block in the path of the motoring novice is lack of confidence to master the position and operation of the car controls "on the road" where there are so many distractions to prevent him giving his whole attention to the correct use of clutch, brake and gear lever. The BSM Prep Driver enables the new driver to learn the position of all controls, to practice their correct use unimpeded by all other problems. It is cleverly designed for all types of car, whether three speed, four speed, centre or the latest "steering column" gear change, and is an exact replica of the driving position of a normal motor car. It is used to introduce the controls to the new driver and later for practicing the sequence of driving operations with an ingenious system of lights to show instantly whether the operation is right or wrong. The BSM-taught driver is able therefore to acquire "Safe Hands" and the Government Test standard in a minimum of time and without sacrificing any of the essential hours of road experience. Finally, the Prep Driver incorporates a Reaction Brake Test equalled only by the most modern Police Training Schools. Thus the Prep Driver, apart from laying the foundations for driving instruction, also provides one of the final tests of driving ability - the "power to stop" in any kind of sudden emergency. Ask the BSM to show you how the Prep Driver works and give you a Reaction Test. Even if you are a veteran motorist you may well be surprised! The model featured here is the Prep Driver in its earliest incarnation. It was designed by BSM Chief Engineer H.J. Griffiths in the company's workshops, as a supplement to traditional driving instruction techniques. Three coloured lights were fitted to the dashboard. A lamp illuminating called for an emergency stop, the pupil's reaction times being recorded for future discussion. By 1954 the design had been improved somewhat, and a screen was now positioned ahead of the driver, onto which a road scene would be displayed. Seven potential road hazards could then be displayed on the screen, one at a time, at the flick of an operator's switch to add further realism to the simulation. These included a dog running out into the road, and a wayward child doing the same, plus the machine could also simulate a car heading towards the pupil on the wrong side of the road. The reverse of the leaflet is used to record a driver's own score in the Reaction Test. Mr Welland, of Welland's Garage took the test while attending the Motor Show in London, on 30th October 1952. His time was 0.4 seconds. Apparently the average reaction time was in the region of 0.7 seconds, while racing drivers, not known for being tardy in responding to adversity, tended to record a time of 0.3 seconds, so Mr Welland did particularly well. Do any Prep Drivers survive? Although over sixty years have passed since this machine was designed, it may be that one or two are out there somewhere. Perhaps someone visiting this page remembers trying one out for size, or has real photographs of such machines in use? 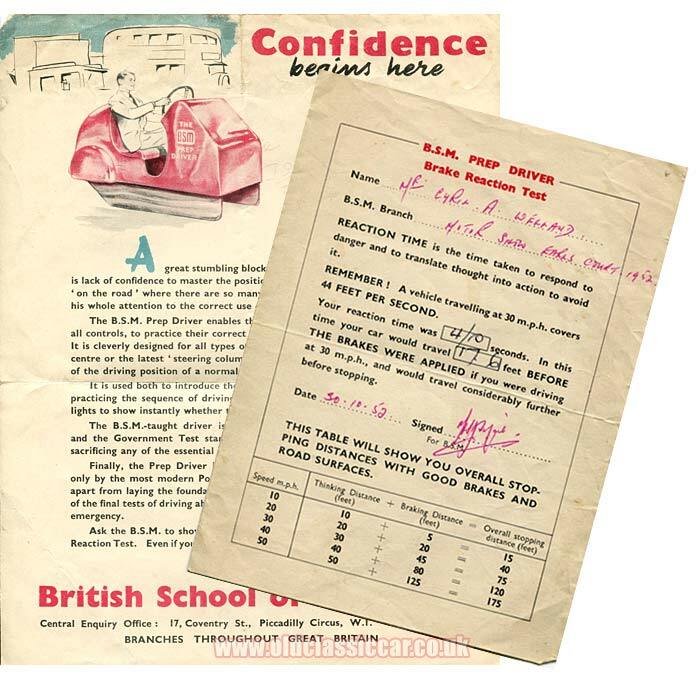 Other items relating to driving tuition on this site include a BSM Prospectus dating to their first year in business, 1910. Designed for children who were keen to get behind the wheel, was Merit's Remote Control Driving Test game, an example of which can now be found here, in the motoring games section of the site. An original appointments card for a BSM student in 1957, can be found on this page of the site.